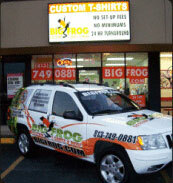 Big Frog Custom T-Shirts is a retail franchise specializing in custom-made T-shirts and apparel. Big Frog utilizes a cutting-edge, eco-friendly system that allows affordable customized printing in any quantity whether it's one or 100. With no setup charges, no screen charges and no art charges, even one shirt becomes affordable. And with great prices, comes great quality and real customer service. As demand for Big Frog products increases, we are expanding throughout the U.S. and looking for individuals to join us. Big Frog offers a fun, creative, enjoyable and green opportunity to control your life and achieve your goals for the future. Owning your own business can provide personal freedom as well as a high level of pride in a job well done. Our concept is driven by emerging technology in fabric dyeing, and is revolutionizing a multi-billion dollar industry. We feature a low total investment compared to other retail concepts, daylight hours 5 1/2 days a week, few and easy-to-find employees, designated territories, and elaborate training, support, proprietary operating systems and best of all it is a cash-based business with no accounts receivable. Multiple unit ownership is available. Best of all, we present an earnings claim in our Franchise Disclosure Document that is the envy of our industry. Low total investment compared to other retail concepts. 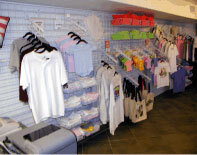 Small retail foot-print- stores are typically between 800 and 1,200 square feet. Professional, daytime hours five and a half days a week. Minimal staffing requirements- typically only one to three employees are needed. Semi-absentee and owner-operator business models. Cash-based business with no accounts receivable. Yes, it will require dedication and hard work on your part. But if you have the drive and ambition to build a business in a gigantic industry that is changing rapidly due to new technology, and be backed by the systems and support of a dedicated franchise company...if you share the passion for excellence and customer service on which Big Frog is founded, we invite you to consider our franchise opportunity. Please note this franchise is not currently accepting inquiries from CA, HI, IL, IN, MD, MI, MN, NY, ND, RI, SD, VA, WA, WI or from outside the U.S. Interested parties should have at least $50,000 to invest. Click on Request Information for FREE info on how to open a Big Frog franchise today! Please Note: This Big Frog franchise opportunity and other franchise business opportunities, businesses and franchises for sale on this web site are not to be considered as an "offering", "franchise offering", suggestion or recommendation by Franchise Leader™. This advertisement depends entirely on the truthfulness of the information provided by our advertisers which includes, but is not limited to, franchisers, franchise brokers, franchise consultants and business brokers. Franchise Leader™ recommends that you consult a lawyer, financial consultant, accountant or professional advisor before buying a franchise or business opportunity or any type of business. By using this form or any part of our website, you have agreed to all terms and conditions of Franchise Leader™. Please review our Terms & Conditions for more information.